After getting married in 1983, Mr. Rapal went into fish street vending as a source of income. When his wife was pregnant with their eldest, he began to think that their current livelihood would not be enough to support a growing family and it moved him to consider venturing into other businesses. At that time, a relative of his was into retailing of second-hand tires and so he offered himself if he could work for him. He was hired to work as washer and filer of tires. When the owner was not around, Lemuel helped entertain clients and this was how he developed his selling skills and got to establish good relationship with customers. 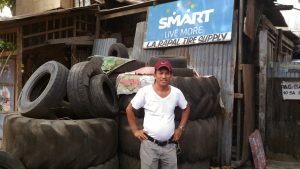 With this experience and after joining a cooperative in 1994, he put up his own second-hand tires business in 1996. He rented a small place at Jacinto St., Davao City and he was the only one running and maintaining it. Photo: Mr. Lemuel Rapal standing in front of his Davao City shop, one of the 6 stores he has put-up while being an excellent loan client of Rizal MicroBank. During his first loan with Rizal MicroBank (RMB), he only had two branches. Today, he has grown the tire supply business into six branches. Because of the credit access provided him, he now has the working capital to use when competing during bids. And because of bulk purchases during bidding, he is able to sell his second-hand tires to his customers at a lower price. As an indication of his business growing, he used to sell only second-hand tires in the past. 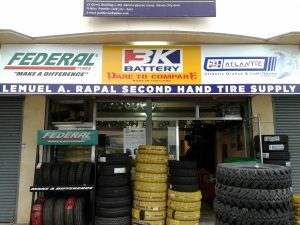 Now, he is also selling brand new tires, alloy rims for different types of vehicles and mag wheels. Photo: Mr. Lemuel Rapal (left) is one of the pioneer clients of RMB Davao who attended the branch formal opening and inauguration in November 2010, seen here with some bank officers. Photo: Mr. Rapal’s hard work has certainly paid-off as can be seen in the façade of one of his 2 stores in davao City. He now sells brand new tires. For his hard work, perseverance and enterprising spirit, he is now reaping the fruits of his labor. He was able to acquire properties such as lots in Mahayahay Tugbok, Davao City, and vehicles like multicab, pick-up, and motorcycles that are used in his business. More importantly, he was able to provide for and sustain the education of his children. Three (3) of his children graduated in college and are now working, while one (1) is still studying in a university in Davao City. Mr. Lemuel A. Rapal is one proud client of RMB and is always thankful for every approved loan he gets from the bank. In fact, he once mentioned that the money he borrows from RMB always gives him good luck. He always claims too that his business is in fact a partnership with RMB since it was the bank’s microfinancing that helped it grow. When he comes to the bank, he tells the staff “MAO NI ATONG NEGOSYO” (this is our business). Photo: Mr. Lemeul Rapal (3rd from left) visited the headquarters of RCBC, the parent company of Rizal MicroBank as one of the chosen clients for the UniBank’s Rise campaign in 2016. 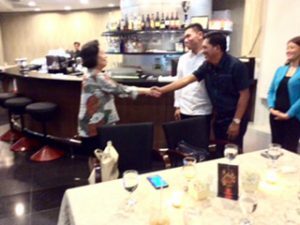 Mr. Rapal claims this is a once of a lifetime experience as he got to meet RCBC Chairperson, Ms. Helen Yuchengco-Dee (left). Because we believe in building true relationships; in progress and possibilities; in giving our best, we are happy and grateful to have in our roster of valued clients and partner, Mr. Lemuel A. Rapal, who is truly a testament to the entrepreneurial spirit of the Filipino people!